We deeply want a revival of domestic religion. 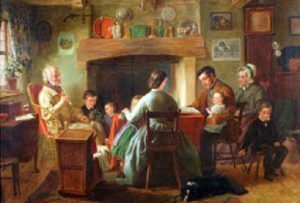 The Christian family was the bulwark of godliness in the days of the puritans, but in these evil times hundreds of families of so-called Christians have no family worship, no restraint upon growing sons, and no wholesome instruction or discipline. How can we hope to see the kingdom of our Lord advance when His own disciples do not teach His gospel to their own children? Oh, Christian men and women, be thorough in what you do and know and teach! Let your families be trained in the fear of God and be yourselves ‘holiness unto the Lord’; so shall you stand like a rock amid the surging waves of error and ungodliness which rage around us.